In many organizations, IT helpdesks are just mediators between end users and IT experts. Often, helpdesk personnel have no visibility of the operational state of the IT services or the different infrastructure tiers. Consequently, when users complain, all that the helpdesk does is to schedule bridge calls or tiger-team meetings for the IT experts. eG Enterprise changes all this. It provides IT helpdesks with unparalleled visibility into the operational state of key IT services – including call centers and critical ecommerce platforms. 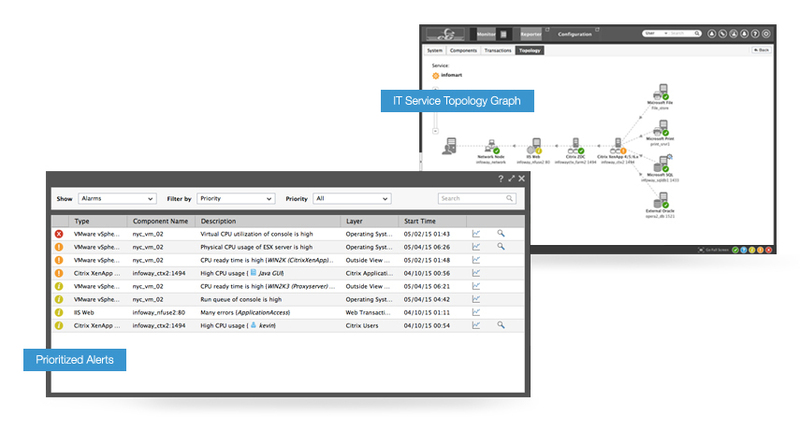 Color-coded service topology maps provide helpdesk staff with visual cues so they can quickly and easily determine which IT expert needs to be involved for troubleshooting a problem. eG Enterprise empowers IT helpdesks to play an active role in IT operations. A top tier bank deploying eG Enterprise saw a 33% reduction in problem resolution times for simple problems, and an order of magnitude reduction for more complex problems that involved multiple tiers. The bank was also able to cut down on the experts who needed to be involved in troubleshooting problems.